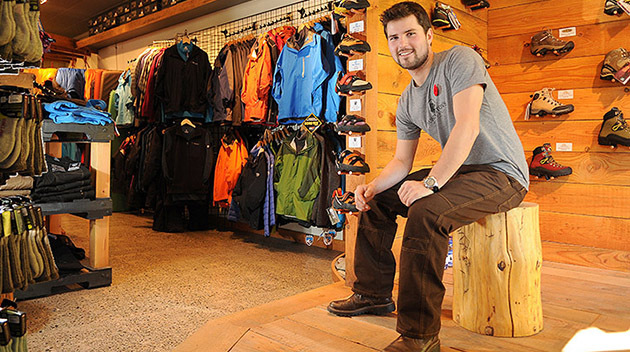 When Sam Waddington is feeling the pressures brought by the competing demands of being a business owner, city councillor, and active community member, he knows where he wants to go: outside. He shared his passion for wilderness experiences in a presentation in the atrium at UFV’s Chilliwack campus at Canada Education Park on Monday, Nov. 30. His presentation, titled Back to the Backcountry: Exploring the Wild and Learning from the Important Places, was part of the UFV Faculty of Health Sciences speaker series. Nature is Waddington’s great escape and stress reliever, and he’s a bit of an evangelist on the topic. Through his Mt. Waddington’s Outdoors business, he sometimes takes teens from local outdoor education programs on wilderness experiences, and their transformation once they get into the forests and mountains never fails to impress him. Waddington is a lifelong resident of Chilliwack who brings his love for the outdoors and the recreational opportunities offered by it to everything he does. He opened Mt. Waddington’s Outdoors in 2012 in order to equip the local population for outdoor pursuits. He ran successfully for Chilliwack city council in 2014 on a platform that championed promoting Chilliwack as an outdoor sports destination. He is a founding member of and donor to the Chilliwack Trails Society and a major advocate of making Chilliwack’s forests and mountains more accessible for outdoor enthusiasts. He has travelled extensively and enjoyed some of the world’s most magnificent wilderness settings, and brings the lessons he has learned along the way to his favourite neck of the woods: Chilliwack and its surrounding wilderness. Not bad for a young man just past his 25th birthday. The UFV Faculty of Health Sciences speaker series is designed to promote awareness of health and wellness related issues. Recent guest speakers have included Dr. Darin Cherniwchan and Sto:lo community activist/nurse/pop artist Inez Jasper.